I'm keeping this short and sweet because its late. I might have over baked mine just a tad, it had a dark golden crust. I traded the raspberry preserves for strawberry preserves. The frosting was a little bit of a pain to make. When I make this cake again I'll probably use a butter/confectioner's sugar icing, the meringue buttercream was a little too 'egg-y' for my tastes. My layers weren't even but it didn't matter. Party cake got great reviews. One taster reported that the coconut was not necessary, I kind of agree. Although it did make the cake 'prettier'. Fun cake to make and eat and I know I'll make it again. Thanks to Carol of Mix, mix...stir, stir for this week's selection! For real! Granted they're the most simple constructions of a skirt you could possibly imagine and the seams aren't perfectly straight and neither are the hems but they're still wearable! I used this tutorial I found last week from Grosgrain. The first one I used some fabric from an estate sale, I'm not sure how much fabric it was but I ended up cutting off a lot of 'extra' because it was pretty long. It took me about 2 hours to finish the first one but that's because I had to re-thread the machine once and wind another bobbin plus it took a few minutes to understand how the construction was going to work. But once I figured it all out it took almost no time. I used 1" non-roll elastic and I did hem the bottom because there were no 'sealed' sides. This one is a little big around the waist but not terribly so. I like the fullness of this one. The next one is made from a vintage sheet from yet another estate sale. I thought it was cotton but it must be a blend of cotton and something else. For this one I used elastic that was a little more narrow than 1". The waist is perfect but it's a little long, so I might re-hem (I have no clue if that's the proper term or not) it. The last one is made from a yard of Heather Bailey fabric I bought last year from Sew Mama Sew. It's shorter than I'd like it to be. I may attempt to add some more fabric at the hem to make it a little less scandalous. I'm really excited I made these all by myself. It's all a learning process and hopefully the more I do the better I'll get. I'm going to make a few more of these because I love wearing skirts during the hot, hot summers here. As mentioned earlier this week, we're eating beans from the garden now. They have climbed all over the trellis Doug built. There are a couple of tomatoes starting I added more mulch over the potatoes and found what appears to be some buds on a few of them. Eggplants are growing but not eggplants. The one little one dried up and fell off. This very tropical dessert was appropriate for the warm weather I think. It's too bad part of it had to be in the oven for 3 hours! One of the best things about TWD is that you make things you normally wouldn't pick out. That was the case for the dacquoise, I would have probably never picked it out on my own. But I'm really glad Andrea of Andrea in the kitchen did because the husband person loved it. He said "I don't think it could be any better." This is high praise from a man who might be the pickiest eater I've ever met. The dacquoise is mostly egg whites with finely ground coconut, powdered sugar and almonds added in. The meringue base had to be baked at a low oven temp for 3 hours, until it was golden brown. There were three meringue sheets and two came out very nicely but one was a little too brown. The next step was making the white chocolate ganache, which is just finely chopped white chocolate and heavy cream chilled. The last elements to do was to roast the pineapple slices and toast the coconut. I took the cheater route and bought pineapple that had already been cut and cored and all I had to do was slice it. I had ran out of powdered sugar by then so I used brown sugar to sprinkle on top of the pineapple. Some pieces were a little more roasted than other but it was fine. In the end when I put it together the ganache was runny so I may have messed up somewhere along the process. But I pushed ahead and put it together. It is not the most attractive dessert ever (my fault) but it tasted great. My pictures are terrible but trust me, it was way tastier than my photos my lead you to believe. I loved the way the juices of the pineapple caramelized and the white chocolate ganache was rich and delicious. A very sweet dessert and I'm so glad I made it. Thanks Andrea! 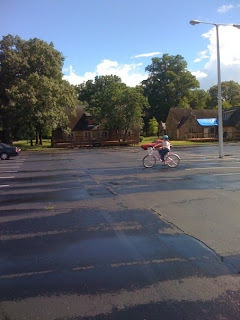 This past weekend we spent a lot of time watching CSI and trying to avoid being outside. Saturday morning we had breakfast at Cafe Eclectic (which besides having the most adorable waitress ever has the best mochas in town) and ran errands. I grilled steaks, summer squash and zucchini for dinner, since it's so hot outside I like just cooking everything on the grill so I don't have to warm up the house even more. Sunday I got up at the crack of dawn in an attempt to beat the sun, so I could finish up planting perennials in the flower bed and spreading some mulch. I was outside for 2.5 hours and was completely soaked by the time I finished. But that stupid flower bed is finally done. When we moved in it was full of overgrown monkey grass (liropa) and that was it. We spent those early days digging out monkey grass and cursing whoever let it take over that bed. Two years later, it contains ferns, several kinds of salvia, a knockout rose, larkspur, daylily, lavender, anise hyssop, foxglove, miniature crepe myrtle, star jasmine, butterfly bush, lamb's ear, dwarf sunflowers, coneflower, cherry sage, mint, phlox and lantana. Everything should come back and hopefully get bigger and fill-in the gaps. My beans were big enough to eat last week, yay! I blanched them and we had them with grilled pork chops. They turn green when blanched, which was kind of cool looking. I picked another batch for dinner tonight. The seed packet says that they'll continue to produce all summer as long as they're picked clean. Last week I had a gathering at our house and one of the things I made was a vegetable platter with vegetables from the Farmer's Market. The only thing that didn't come from there were the grape tomatoes. When I saw the purple cauliflower I knew I had to have it, when I blanched it the water turned purple and I stored that fact away for later use because it might come in handy if I ever chose to dye my own yarn with natural dyes. I finally finished that shirt I've been trying to sew together for ages. Again, my friends helped me and in fact they probably weren't going to let me leave until I finished it. The hem looks a little wonky, but it is my first shirt so that's to be expected. It's this Simplicity Built by Wendy pattern. I cut out another top the same day but I needed fusible interfacing, so I didn't do anything with it yet. Maybe I'll work on it this weekend, the fabric is from Joanne's. Holy heck it's hot and humid in Memphis again. Blech. You cannot be outside for more than 5 minutes without sweating buckets. I.hate.the.heat. Luckily, this week's TWD did not require me to fire up the oven, instead I fired up the ice cream maker - Honey-Peach Ice Cream, chosen by Tommi of Brown Interior. My ice cream was 50% local, the peaches and the honey I bought at the Memphis Farmer's Market from local folks and the whole milk is from the dairy in my hometown. I had not made an ice cream yet that was 'cooked' beforehand. I cut up and boiled the peaches and honey together, it sputtered and spattered even after I turned down the heat. I followed the rest of the directions of mixing the milk and cream and tempering the egg/sugar mixture, etc. My problems arose when I was getting the custard to thicken, it took f o r e v e r to thicken and afterwords it had tons of tiny clumps. I was rather concerned. I put the mixture in the fridge and waited. After the mixture was chilled I put it into the ice cream make and crossed my fingers. As it churned the texture seemed to smooth out and I snuck a taste towards the end. The honey has a very prominent flavor and the peaches too. I have to say though I thought the texture was a little - off? Maybe it's because it was clumpy before I put it in the maker? I don't know, it's tastes fine but leaves a weird filmy aftertaste. Or maybe this is how is it with all cooked ice creams? Anyway, it was still delicious and I really enjoyed making ice cream in a different way. I'm totally guessing on what week it actually is. I know I had something in the ground by the end of April but I'm not 100% sure before that. So we're saying this is week 10. Purple pole beans are insane! This is what they started out as and this is where they're at now. Amazing! We'll be eating this either the end of the week or the middle of next. Such a good grower, I'll be be planting these again next year. I'm really happy with how well they've done so far. Eggplant is growing, but only one little eggplant so far. I might have to intercede and pollinate them by hand. Potatoes are also growing like crazy, They've grown past their pine straw so I have to mound more loose compost at the bases again. They aren't blooming yet but I'm hopeful they'll start soon. I might have seen a potato beetle the other day or maybe I was imaging it, there are a few holes in some leaves which leads me to believe something has been enjoying the foliage. The potatoes have grown so much I'm going to have to relocate the butternut squash that's at the end of the bed so it will have room to grow. My cucumbers developed tendrils last week so I had Doug make a trellis for them. It's mostly cotton yarn attached to this post and the sides of the raised bed. But once they grow up the yarn you won't even be able to see it. A couple of them are starting to flower so maybe it won't be too much long before we have cukes. All of the tomatoes are growing, most are starting to bloom too. I'm on the lookout for tomato horned worms, which love to gnaw the leaves away from the plants. I finally bit the bullet and pulled out the carrots and lettuce they hadn't germinated well. I replaced them with bush beans I ordered from High Mowing Seeds. I didn't remember they were bush beans until I had Doug build and install a trellis. Oops. I also planted two varieties of pumpkins I also bought from High Mowing. I've never grown pumpkins so they may be a fail, we'll have to wait and see. Pimento peppers are getting closer to being ripe. and the herbs are all well. I did have one herb casualty, the curry plant I bought in March just keeled over and died. I'm not sure why because everything else around is growing like gangbusters. Weird. Oh and we have grapes?! We bought four grapevines last spring and the man who sold them to us told us we wouldn't have grapes for 4-5 years. So I'm not sure if these will become 'real' grapes or what. These are either Concord or Red Flame. 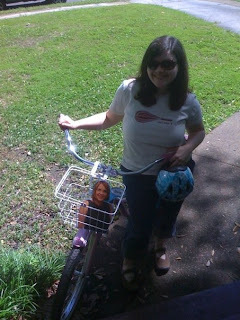 In my best Melissa voice "Y'all I learned how to ride a bike!" 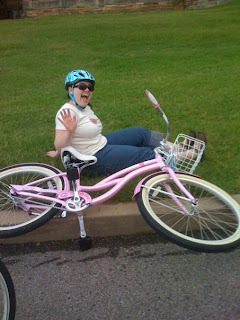 After two years of owning a pink Trek cruiser and twenty-eight years of never learning how to ride a bike period I finally learned. And it was all thanks to some very sweet, patient and generally awesome friends from the MKM (Memphis Knit Mafia). It took a few hours but I managed to ride and only fall off and hit concrete once. Hallelujah. I even got a basket and bell for it, which Doug very kindly installed. I'm still kind of wobbly and skiddish on it right now, especially when I see a car. But hopefully with practice I can manage to get better. My goal is to be able to ride my bike to the coffee shop or Panera Bread, which is maybe a two miles from my house, (maybe less, I'm terrible with distance) by September. Because maybe by mid-September it won't be a thousand degrees outside. I don't really think this could be any easier. Puff pastry + fruit + butter + sugar. Yum. I used Pepperidge Farm puff pastry shells, which I just happened to have in the freezer. I subbed peaches for the apples because I picked up some great peaches at the Memphis Farmer's Market Saturday (saving some for the Honey Peach ice cream). Super simple dessert and it tasted great. I put a few scoops of Ben & Jerry's Mission to Marzipan on the side. Delish. Thanks to Jessica of My Baking Heart for this week's selection.